To access the list of all Orders placed on your website, please go to SALES → Orders. Though information cannot be changed from the order grid directly, this offers a great “at-a-glance” perspective on how your team is performing in real time. 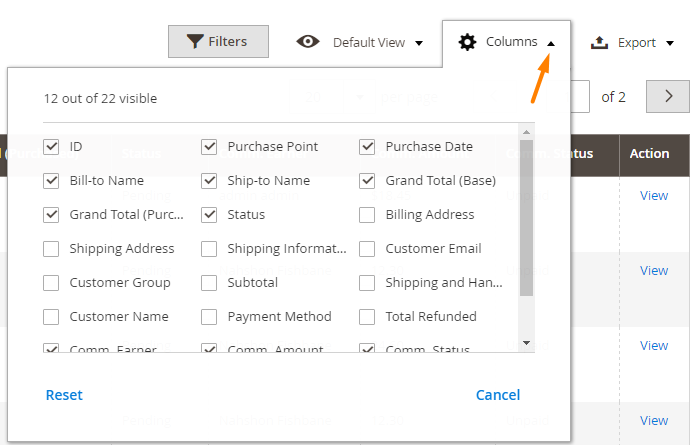 Depending on the options you selected during configuration, your order grid may show different columns. Keep in mind that admins can see all information here, but depending on the Roles settings, other employees may not be able to see earnings or even names. When viewing a specific order, the information on the Sales Rep/ Manager commission is under the tab ' Commission'. Because different users may have different commission rates, the commission amount will be dynamically updated any time the commission earner is changed. Admins (or managers with appropriate permissions) can easily update commission payment status to reflect whether or not commissions are eligible or paid. Get more information about the Sales Representative Commission Manager Extension for Magento® 2. Find other Magento products at the CreativeMinds Magento Store. Let us know how we can Improve this Product Documentation Page. To open a Support Ticket visit our support center.